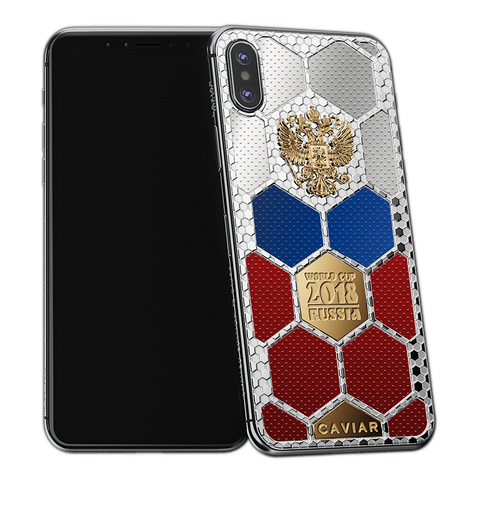 Caviar iPhone X National Teams Russia "Specifically for the Football World Cup 2018 that will take place in Russia, the brand of the luxurious accessories, Caviar, has created exclusive designs of the smartphones, dedicated to the national teams. Their modern, bright, attractive design that the colors of the different countries’ flags are integrated in, allows every fan to choose a properly equipped phone. The case’s geometry is lined according to the traditional soccer ball’s formatting; the central place is taken by the state emblem, below is the commemorative inscription eternalizing the important sport event not only in our memory, but also in the phone’s design. Now, of course, we see the smartphone addressed to the football fans from Russia. 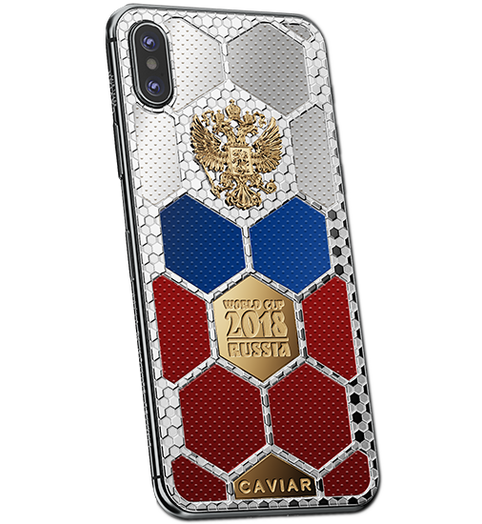 In the design of this smartphone, not only the faith in our national team and the Russian sport, but also the pride of the fact that the World Cup in Russia is arranged at the highest level, are enclosed. Russia is ready to welcome guests, impress them and make them fall in love forever! Celebrate the amazing triumph of your country with a luxurious smartphone that will become the symbol of your pride and joy. Go, Russia!" 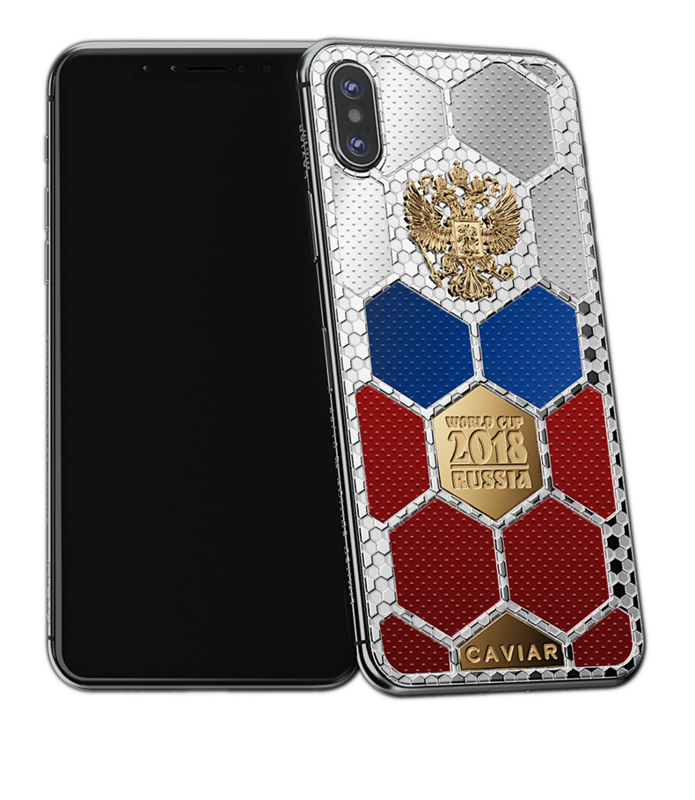 "Specifically for the Football World Cup 2018 that will take place in Russia, the brand of the luxurious accessories, Caviar, has created exclusive designs of the smartphones, dedicated to the national teams. Their modern, bright, attractive design that the colors of the different countries’ flags are integrated in, allows every fan to choose a properly equipped phone. The case’s geometry is lined according to the traditional soccer ball’s formatting; the central place is taken by the state emblem, below is the commemorative inscription eternalizing the important sport event not only in our memory, but also in the phone’s design. Now, of course, we see the smartphone addressed to the football fans from Russia. 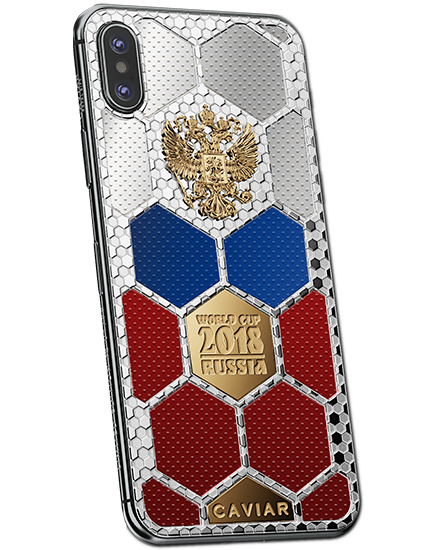 In the design of this smartphone, not only the faith in our national team and the Russian sport, but also the pride of the fact that the World Cup in Russia is arranged at the highest level, are enclosed. Russia is ready to welcome guests, impress them and make them fall in love forever! Celebrate the amazing triumph of your country with a luxurious smartphone that will become the symbol of your pride and joy. Go, Russia!" Colored artificial stone. (National colors of Russia).